When the child encounters a dangerous situation, press SOS emergency help, parents know the child as soon as possible to help the situation. Smart watch can be waterproof for proper life. Message, Phone book, Scenery mode, Call records, Alarm clock, calendar, calculator, recorder, camera, music player, 2048, the classic square, schulte grid. We provide Smartwatch only but without SIM Card, please buy extra GSM network SIM Card. We'd like to recommend to use SPEEDTALK SIM (Belongs T-mobile Network). 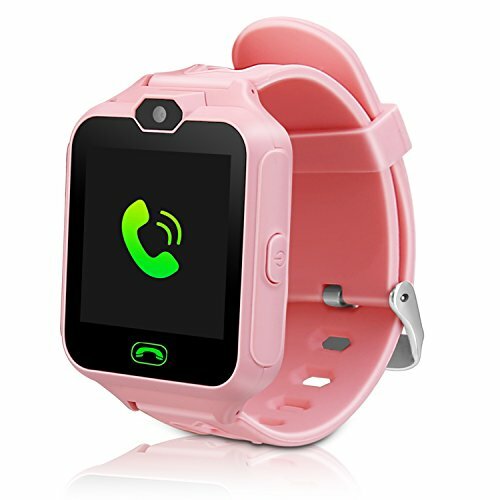 ★★COOL PHONE WATCH: 1.44 inch color touch screen design, full HD full color paste, showing the effect of fine, simple operation, to meet the needs of children. ★★TWO-WAY COMMUNICATION: Two-way high-definition call, communicate with your child is very simple, you can talk to your child anytime, anywhere to share the mood, caring about the situation, parent-child interaction everywhere. ★★INTERESTING FUNTIONS : Regular alarm clock, develop good habits, develop the concept of time for children, get up and go to school on time，not to be late; cameras, children can take pictures of real-time scenes to share with their families; calculator function, built-in calculator function, can assist children in math exercises; recording function To record interesting topics around you. ★★PUZZLE GAME and LONG STANDBY: The classic square, Schulte grid, 2048, let the children fall in love with learning, better enhance intelligence; long standby, enjoy playing, theoretically standby 3-5 days, the machine fully charged about only 1 -2 hours. ★★SAFE MATERIAL: Intelligent children's watches with a safe material, parents do not have to worry about children's long-term wear will affect their health, you can rest assured that use. If you have any questions about this product by TTHO, contact us by completing and submitting the form below. If you are looking for a specif part number, please include it with your message.